Boneless skinless chicken breasts are a convenient and healthy choice for meals. Chicken breasts are an affordable and practical way to add protein to your meals without adding significant amounts of fat. Baking can produce a flavorful and moist chicken breast to serve on its own or to use in salads, soups and sandwiches. Understanding the nutrition in a baked chicken breast can help you plan healthy, well-balanced meals. You should aim to consume 10 to 35 percent of your daily calories as protein. The recommended daily allowance of protein for adult women is 46 grams, while adult men require 56 grams each day, according to the Centers for Disease Control. A 100-gram or approximately 3.5-ounce serving of boneless skinless chicken breast meat provides 31 grams protein. Chicken is a complete protein, meaning it provides all the necessary amino acids. 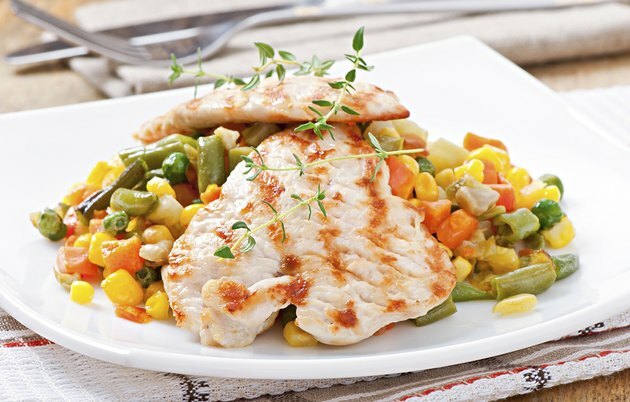 Including just one serving of chicken breast in your diet can help you reach the recommended allowance of protein. If you bake your boneless skinless chicken breast without additional fat, a 100-gram serving has only 3.6 grams of fat. The same serving of adds 91 milligrams cholesterol to your diet. The fat and cholesterol levels in boneless skinless chicken breast are comparable to those in other very lean meat, including very lean cuts of beef and pork. The Cleveland Clinic recommends you consume less than 200 milligrams of cholesterol daily and limit your fat to no more than 50 to 70 grams per day. A serving of baked boneless skinless chicken breast adds only 165 calories to your meal. You can season with herbs and spices without adding calories. If you opt to brush chicken with sauce or oil before baking, you will be adding calories and possibly fat. Keep both the calories and fat low by using an olive oil-flavored nonstick cooking spray in place of oil. Boneless skinless chicken breast provides some vitamins and minerals along with protein. A serving will help you to meet your needs for iron, pantothenic acid, vitamin B-12 and selenium. Chicken is a good source of zinc, but the breast contains lower amounts of zinc than the leg and thigh. Depending on your age and gender, you need 8 to 15 milligrams of iron and 12 to 15 milligrams of zinc daily. The recommended daily allowance for selenium is 55 to 70 micrograms. While there is no recommended amount of pantothenic acid, 5 milligrams is considered adequate for both men and women. Adults need at least 2.4 micrograms of vitamin B-12 daily, with higher levels required during pregnancy and lactation. Women need more iron than men, but men require higher amounts of most other nutrients.